Results from a Mintel survey of over 7,000 consumers across Europe reveals that people in Spain, Italy and Poland are more concerned about the effects of Brexit on their own economies than British consumers are on the UK economy. In research specially commissioned in the aftermath of Britain’s vote to leave the European Union, global market intelligence agency Mintel finds that almost half (48%) of Spanish consumers fear that Brexit will have a ‘somewhat’ or ‘extremely’ negative impact on their own economy, as do 41% of Italian and Polish consumers respectively. Additionally, over one in three (36%) Germans agree that the UK’s vote to leave will have a negative impact on their country’s economy, with 31% of French consumers saying they expect it to impact France’s economic growth. In comparison, two in five (39%) Brits say they expect the UK’s vote to have a negative impact on their economy. A sizeable minority of British consumers welcome the result and think that it could be good for the economy: 25% think that it will have an ‘extremely’ or ‘somewhat’ positive impact. But their European counterparts are far more negative about the UK’s economic prospects now that the country has voted to leave the EU. Over three in five (64%) Germans say that the Brexit vote will have a negative effect on Britain’s economy, as do 58% of Spanish consumers, 50% of French, 43% of Italian, and 41% of Polish respondents. While the negative effect on their own country’s economies is top of European consumers’ Brexit concerns, fears over unemployment are also high. 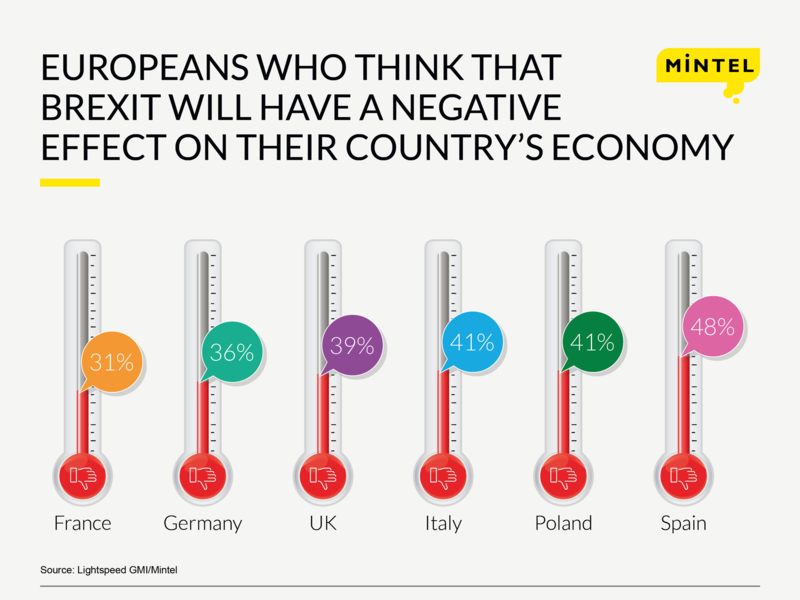 Mintel research finds that 42% of Italian, 40% of Spanish and 50% of Polish consumers believe that the UK vote to leave the EU will have a negative effect on their respective national unemployment levels. In comparison, less than two in five (37%) UK consumers say they expect Brexit to have a negative impact on the UK’s unemployment levels, with 24% saying it will have a positive effect. Topping the list of UK concerns, many British consumers believe that the cost of living will be negatively impacted by the UK’s vote to leave the EU. Almost half (46%) of UK consumers say they expect the cost of living to be negatively impacted as a result of Brexit, followed by 41% of Italian, 36% of Polish and 34% of Spanish consumers. German consumers appear less cautious, with fewer than one in four (22%) saying they expect their cost of living to be negatively impacted by Brexit. The research highlights a distinct contrast in attitudes towards the impact that Brexit will have on the economy as a whole and the effect that it will have on individual financial situations. Just 27% of Brits say they expect their household income to be negatively impacted by the UK’s vote to leave, followed by 25% of Italian, 24% of Polish and 20% of French and Spanish consumers respectively. Additionally, the majority of consumers, both in the UK and in other European economies, expect Brexit to have limited or no effect on their own career prospects. Less than three in 10 Spanish (29%), Polish (27%), Italian (27%) and British (23%) consumers say that the UK’s vote to leave will have a negative effect on their career prospects, while just 18% of French, and 12% of German consumers say they’ll feel the effects. “It’s clear that the vote has unsettled people, but in the UK especially, people separate the impact that Brexit will have on the economy as a whole, and what it means for their own finances. For the moment at least, five years of steady economic growth and falling unemployment means that many people feel well-insulated from the potential downsides of the vote.” Toby comments. While consumers across Europe share fears over the impact of Brexit, research from Mintel’s financial confidence tracker reveals that post referendum, UK consumer confidence has been undermined, but that it hasn’t collapsed. In results collected post-referendum asking Brits about their financial situation over the next year*, just over one quarter (27%) of consumers said that they were pretty confident they would be ok, down from one in three (33%) Brits who agreed with this in May 2016. Meanwhile, 55% said they were concerned about their finances over the next year, but should be fine, up from 52% who said this two months previously. “British consumers are far more optimistic about their own financial situation than they are about the prospects for the economy as a whole. For most people, nothing has actually changed yet – they’re still in a job and prices in the shops haven’t changed dramatically. It’s this tendency to separate their personal situation from the broader economic picture that explains why Mintel’s consumer confidence data hasn’t fallen as much as might be expected. The uncertainty about the future has hit sentiment, but it hasn’t been enough to wipe out the gains we’ve seen over the last few years.” Toby comments. However, Mintel research does indicate that Brexit uncertainty is having an effect. Many consumers are reluctant to commit to big-ticket purchases, reflected in the fall in the proportion of those who plan to make home improvements. Just 18% of Brits say they plan to spend money on the home in the next three months**, down from one quarter (23%) who said the same before the vote in May 2016. But other spending plans are holding up much better: one in four (25%) say they plan to book a holiday in the next three months, down by just 2 percentage-points (27%) from May 2016, despite the fall in the exchange rate. Similarly, spending on certain entertainment activities remains unchanged as the proportion who plan to go to a concert, sporting event, or the theatre in the next three months holds steady at 25%. Meanwhile, there has been no change in the proportion of consumers planning to buy or replace a car (11%), buy a major domestic appliance (12%) or reduce their non-mortgage debts (20%). “Post referendum, the nation’s spending intentions don’t appear to have shifted markedly, other than plans to spend on the home, which seem to have been hit the hardest. For most consumers, there’s no real trigger to change spending patterns at the moment.” Toby concludes. Press review copies of the research and interviews with Director of EMEA Research Toby Clark are available on request from the press office.